The PS 501 is a constant-voltage, current-limiting 0 to 20 VDC power supply designed to operate in any compartment of a TM 500 Series Power Module. The PS 501 is a floating power supply in which either terminal may be grounded, or floated to 350 VDC + peak AC. Front-panel controls provide continuously variable voltage selection, as well as current limiting from 0 to at least 400 mA. The floating supply is suited for powering discrete transistor circuitry, or acting as a bias or reference supply. Several PS 501 's or other suitable supplies can be combined for applications involving complementary circuitry, linear integrated circuits, or any circuitry requiring cascading DC levels. A ground-referenced +5 V auxiliary supply is also included which is suitable for bipolar logic, light-emitting diodes, incandescent displays and similar applications. With the floating supply available for powering discrete interface circuits and level shifting, the PS 501 can be used for many digital/analog applications. The presence and variablilty of output voltage is verified by a voltage indicator light on the front panel. The brightness of this light varies with output voltage. A panel-mounted, light-emitting diode lights when the PS 501 goes into current-limiting. This is a very sensitive indicator which starts to glow before hard limiting occurs. Hard limiting is indicated by maximum brightness of the light-emitting diode as well as a dimming of the voltage indicator light. These functions are easily evaluated by momentarily shorting the output of the supply. OUTPUT: Continuously variable from 0 to at least � VDC. Insulated for 350 VDC + peak AC above ground. Continuously variable current limit from 0 to at least 400 mA. MINIMUM RESOLUTION : 10 mV. LOAD REGULATION : Within 1 mV with a 400 mA load change. LINE REGULATION : Within 5 mV for a �% line voltage change. RIPPLE AND NOISE : 0.5 mV P-P or less. 0.1 mV RMS or less. TEMPERATURE COEFFICIENT : 0.01%/°C or less. STABILITY : 0.1% + 5 mV or less drift in 8 hours at constant line, load and temperature. TRANSIENT RECOVERY TIME : 20 μs or less for a constant voltage to recover within 20 mV of nominal output voltage after a 400 mA change in output current. OUTPUT (+20°C to +30°C) : 4.8 VDC to 5.2 VDC at 1 A. LOAD REGULATION : Within 100 mV with a 1 A load change. LINE REGULATION (+20°C to +30°C) : Within 50 mV for a �% line voltage change. RIPPLE AND NOISE (1 A) : 5 mV P-P or less. 100 μV RMS or less. STABILITY : 0.5% or less drift. OVERLOAD PROTECTION : Automatic current limiting and over-temperature shutdown. The following procedure is intended to prepare the instrument for immediate use and demonstrate the basic function of the unit. 1. Press the OUTPUT button to apply power to the plug-in. Observe that the VOLTS indicator light comes on (the light will be very dim at low voltages). 2. Adjust the VOLTS control for approximately 2 V.
3. Set the CURRENT LIMIT control fully ccw (to protect the ammeter). 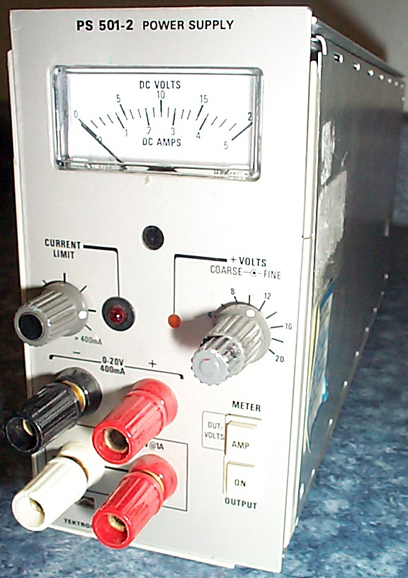 Connect an ammeter (or use the internal ammeter) across the + and - terminals and adjust the CURRENT LIMIT control for the maximum desired current output. 4. 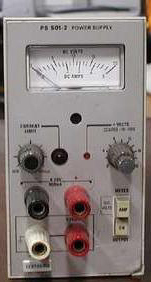 Remove the ammeter, connect the load to the + ane - terminals and adjust the VOLTS control for the desired output. 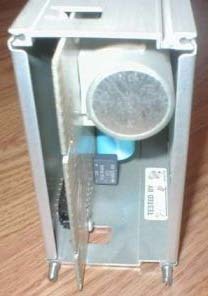 METER Pushbutton changes the monitoring meter from DC volts to DC amps. CURRENT LIMIT Control and Indicator continuously variable control that selects the output current limit from 0 to at least 400 mA. Light emitting diode indicated when the PS 501-2 goes into current limiting. Maximum brightness indicates when hard limiting occurs. VOLTS Control and Indicator continuously variable control that selects from 0 to 20 V output at the + and - terminals. Front panel marked in 2 V increments. Voltage indicator lights when power is applied to the PS 501 (OUTPUT pushbutton pressed). Brightness varies with the output voltage. The outputs of two or more supplies can be connected in series to obtain an output voltage equal to the sum of the output voltages from each supply. The maximum output is limited to 350 VDC + peak AC(i.e., the isolation voltage rating between the output terminals and ground). Each supply must be adjusted individually to obtain the desired output voltage. NOTE The PS 501 (-1) has internal diodes connected across the output to protect any of the series-connected supplies against reverse polarity if the load is shorted, or one of the supplies is not on. The outputs of two or more current-limiting, automatic-crossover supplies can be connected in parallel to obtain an output current equal to the sum of the output currents from each supply. Each supply mst be adjusted individually to obtain the desired output current. One supply should be set for the desired output voltage and the other should be set for a slightly higher voltage. The supplly set for the desired voltage will then become a constant voltage source, while the supply with the higher voltage output becomes a current-limited source (due to automatic crossover) which results in their output voltage decreasing to that of the supply with the lowest output voltage.